Forever Spaces in Haddington, founded in 2015, has grown its local team to eight designers, fitters and project managers, and has just added a showroom manager and new joiner. The company designs and installs stylish kitchens, bathrooms and wardrobes from its new showroom at 1-2 Church Street, Haddington, and their purple liveried vans can now be seen driving around East Lothian and Edinburgh. The newest recruits are Fiona Morrison from Haddington, and Bob Black from Macmerry who joined Forever Spaces from Laurence Mackintosh, the renowned Edinburgh joinery and cabinet makers. 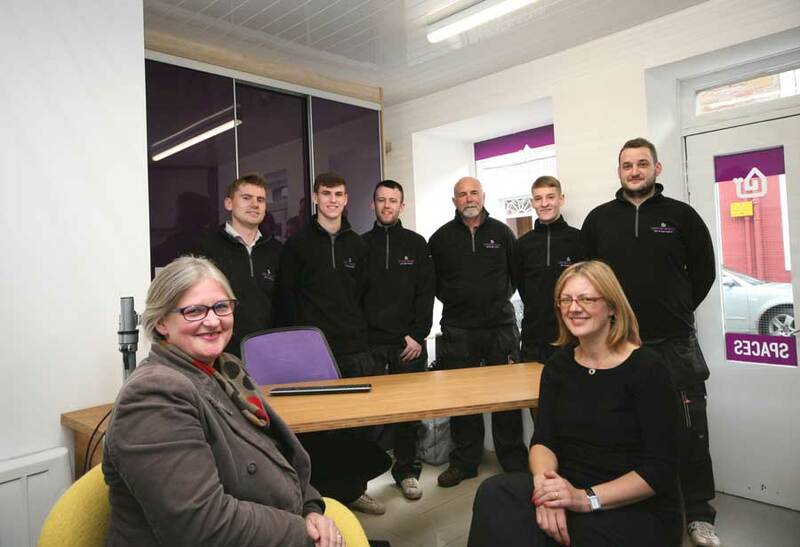 Forever Spaces is one of the only East Lothian firms of home designers and installers to employ and train apprentices; meet Jack in Plumbing and Robson in Joinery. Both Jack and Robson are from Musselburgh, and are just over a year into their apprenticeships. They were selected from more than 180 applicants. “We like to invest in local talent and develop our own team who understand high standards,” says Rod Williams, who founded Forever Spaces. “Our company vision is to simply design and bring to life your dreams for your home, from clever storage solutions to beautiful kitchens, bathrooms and home offices. “We want to really understand your requirements, in terms of design, space and budget, so we ask a lot of questions and try not to make any assumptions. We never forget that it’s your project. Rod continues: “We aim to offer a new concept in interior design and installation by focusing on creating space in our clients’ homes to provide low maintenance, beautiful spaces with clever storage. Having performed a full pre-installation site survey, the Forever Spaces installation team arrive at the agreed time in their liveried vans. Each installation is fully project managed to ensure everything runs smoothly and on time, wherever possible. You can visit Forever Space’s new showroom at 1-2 Church Street at the end of the Haddington High Street for a coffee and complimentary design meeting. Forever Spaces is also exhibiting at the Edinburgh Home Building and Renovating Show at the Royal Highland Centre on 21-22 October. Want us to transform your home? Contact Forever Spaces for your free Design Meeting on 01620 825808.